Do you have a fifth, sixth or seventh grade girl in your life who likes soccer? Well, here’s a spot of shameless self-promotion. I’m going to share a few reasons why you might consider getting a copy of DEFENDING IRENE as a Christmas present for a girl who loves to play soccer. A thirteen-year-old American girl plays on a fiercely competitive boy’s soccer team during the year her family spends in Italy and experiences culture clashes both on and off the field. A girl who plays soccer in Italy is regarded in much the same way as a girl who plays football in America. So Irene faces opposition from players, coaches, and even her Italian grandmother. The March, 2008 of Library Sparks included this novel in their round-up of soccer picks as did School Library Journal in their Extra Helping series. It was also listed in Nancy Keane’s The Big Book of Teen Reading Lists in the Girls in Sports category for younger teens. You typically won’t find this book at a bookstore–it was published a long time ago–so you’d probably have to order it by clicking on one of this link to Amazon. 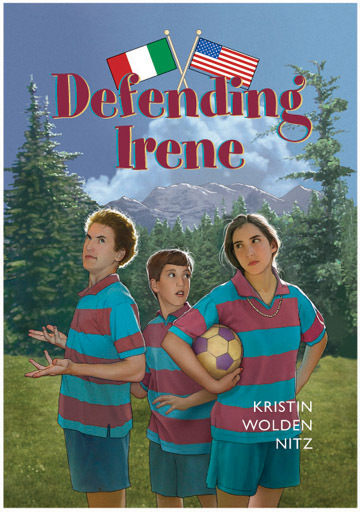 But if you think DEFENDING IRENE might interest a young soccer-playing friend, another very good option would be to check it out at your local library or talk to your children’s librarian about ordering a copy. I’ll do it! If my daughter doesn’t like it I know I will! Thanks so much, Lara. There’s been one rule change that your soccer-loving daughter might notice. The book has been out for awhile and it wasn’t in the literature when I was doing my research. But I really do think the rest of the book holds up really well!